Kaju Katli is a very popular Indian sweet which I have posted long time back. Kesar Kaju katli is one that includes saffron and is more exotic and rich. This expensive sweet can be easily made at home. Today we will learn how to prepare Kesar Kaju Katli recipe following our easy recipe with step by step pictures. Now boil the sugar syrup until you get a one string consistency (kambi padam in tamil).Then add the cashew nut paste and the saffron strands. To know more about one string consistency check out my Boondi Laddu recipe. Note - Even if you add the cashew nut paste a stage before one string consistency, do not worry, you have to cook for a longer time. That's all. 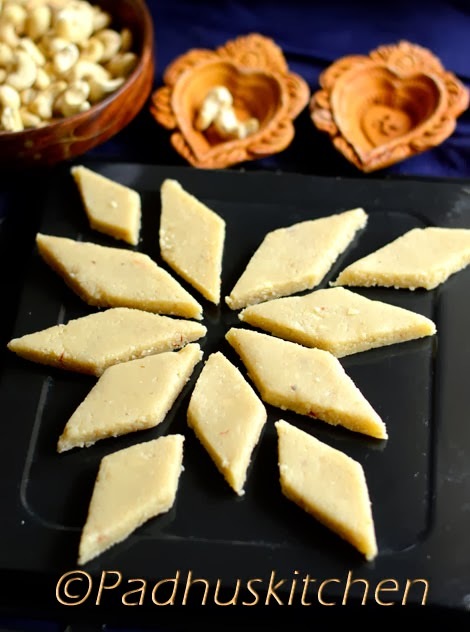 Check out my Kaju Katli recipe with a totally different method of preparation. Find a collection of more than 50 Diwali Sweets and Snacks Recipes or click the picture below to take you to that page. Such a perfect looking kaju katli,I once tried the same way ended up making laddus as I was not able to spread,any thoughts plz? Looks divine,thanks for sharing this wonderful recipe. looks really yummy! saffron lends a unique flavor too. Harini.M - You have to cook for some more time then. I want that box of kesar kaju katli, wish i live near you. shall i grind the cashews in mixie or grinder? Made this for last diwali. Will be making it again and a quite a few other based on your recipes. Thanks. Why do we need to soak d cashew? Wats d difference between burfi made from soaked n unsoaked one? You should cook for a few more minutes.